The knitting isn’t going to make a great photo opp. The blue and white striped sock continues to be blue and white. Once I’m past the heel or near the toe, perhaps it would look more interesting. But really. Yawn. Last night was filled with disturbing noises from the outside world… perhaps a bit too much excitement for me to sleep enough to make today any fun. Hopefully everyone who was on the warpath last night has sobered up and are willing to stay the heck home. One can hope, eh? Hopefully by the weekend I’ll have laddered back and reknit the Arches project (I did catch a runner in the lace section before it got too far… there’s hope). Maybe pics of that before too long. It’s at least pink and fits into PS4 Red. Which may or may not become a gift for someone. It’s still in process, and hopefully there will be enough on this skein to finish. Nicknamed “Arches,” because I first thought that I’d get in a couple of arabesque arches in the thing. I don’t think that’s been accomplished, so maybe I’ll just call this thing, made out of the silk from the swap table, “Archie” after a character from Eight Cousins. I had quite the run on knitting it on Sundays, during Dr. Who radio broadcasts for Christmas. Alas, it isn’t finished yet. But I love how the colors are turning out in this yarn. Just yummy. Again, this was destined for someone, but I found I needed more time to make sure my tension was correct with this yarn. Oh well, probably a book was a better bet for this person anyway. … Until I get used to my new schedule (or find a public transit answer to all the ring roads of my mornings and evenings), there will be a dearth of knitting ’round here. However, I hope to finally get one of my projects finished and blocked on New Year’s Day, in between making soup for a potluck. If not that, then it’s more work on some socks. around the light fixtures. And they’ve scraped the foam against the attic ceiling to cut off excess. It looks like a butter cream frosting experiment gone wrong, with splinters. Silk or Rayon? Still beautiful. 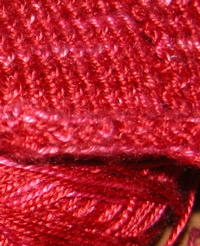 My current knitting is a little something from some unidentified lace weight (silk?) yarn that someone left on the swap table at the retreat. No identification on the little cake of yarn, but it’s luscious. I’m so amused, I’ve been doing imitations of Jo Ann Worley from Laugh-In (can’t find the yodel that I’m mimicking). Yes, I do embarrass my family. Whatever. I’d love to thank the person who left this preciousSSSs on the swap table. They may have had to buy extra to finish a project and then couldn’t look at it ever again. Or, perhaps, they didn’t like the color. Me, I’m giggling. Well, that and quoting Gollum. Thanks, OK? The socks in just plain regular yarn (leftover from another project) do not benefit from my lack of monogamy. But look at this new yarn — it’s just shiny and it feels nice. I think we can understand why I’m fickle. Right? I’m not precisely sure what the yarn will grow up to be, but we’ll see. 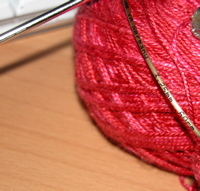 If it turns into something good, you might not see this yarn again for months.